Cars are due November 10th, 2018. Racing will start the following week. Video and results will be posted the following Saturday, November 17th. Cars can be mainline cars or any of the special series cars, ie color shifters, character cars, pop culture cars, etc. Just as long as it says Hot Wheels. Winner take all race - meaning whoever wins gets all the cars in this race. 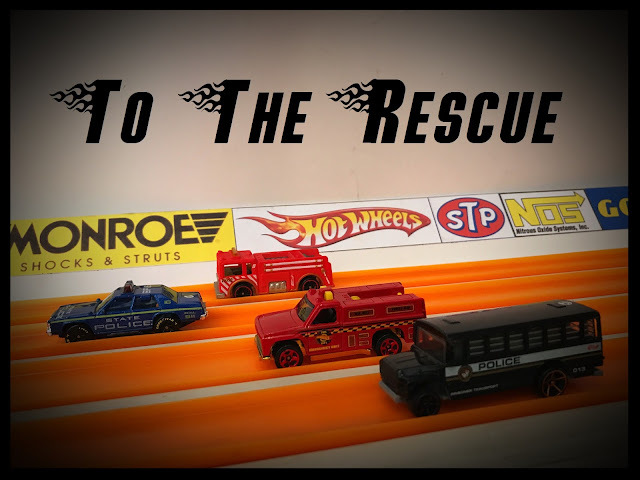 This month's feature race is To The Rescue, featuring police, fire and rescue cars and trucks. A big thanks to the brave men and women in uniform that keep us safe. Take this chance to remember them this month by racing your fastest police, fire, and rescue cars and trucks. Cars due November 10th, 2018. (That's a week earlier than usual to get all the racing done before Thanksgiving) Racing will start the following week. Video and results will be posted the following Saturday, November 17th. This race is part of the 2018 points series.